Strandline Resources Ltd (ASX:STA) (OTCMKTS:STQNF) is pleased to announce Aircore (AC) drilling results for the heavy mineral sands mineralised corridor south of Tanga confirms the discovery of multiple new higher grade deposits at Tajiri and Pangani-Tongoni tenements and shows potential to significantly extend the existing Tajiri Mineral Resources. 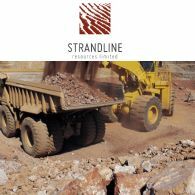 Strandline Resources Limited (ASX:STA) is pleased to advise that it has executed a Binding Heads of Agreement (HOA) to acquire a 100% interest in a subsidiary of Jacana Minerals Limited (Jacana), the Tanzanian mineral sands focussed explorer spun out of ASX listed Syrah Resources Limited (Syrah) in 2014 (the Acquisition). 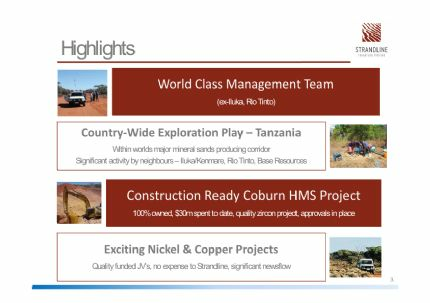 Strandline Resources Limited (ASX:STA) is pleased to report that it has received 13 mineral assemblage and characterisation test results from 4 holes completed at the Madimba and Madimba East prospects in southern Tanzania. 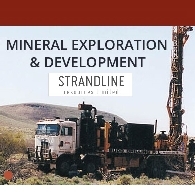 Strandline Resources Limited (ASX:STA) ("Strandline" or "Company") today announced that Mr William (Bill) Bloking has stepped down from his position as a Non-Executive Director with the Company to enable him to spend more time with his family in the USA. 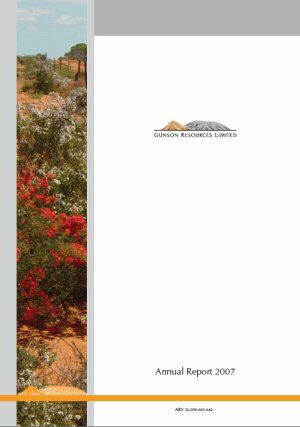 Strandline Resources Limited (ASX:STA) is pleased to present the initial findings of a Cost Review investigating potential cost reductions and other value adding opportunities for its 100% owned Coburn Heavy Mineral Sands Project, located in Western Australia. Strandline Resources Limited (ASX:STA) advises that the first batch of assays from the maiden auger drilling (to an average depth of only 6m) at its 100%-owned Madimba Project (PL 9970/2014) in southern Tanzania confirm extensive zones of THM mineralisation starting from surface, with several holes ending in the highest grades encountered.